In 1963, Birmingham, Alabama, was perhaps the most racially segregated city in the United States, but the campaign launched by Fred Shuttlesworth, Dr. Martin Luther King, Jr., and others demonstrated to the world the power of nonviolent direct action. Often applauded as King's most incisive and eloquent book, Why We Can't Wait recounts the Birmingham campaign in vivid detail, while underscoring why 1963 was such a crucial year for the civil rights movement. King examines the history of the civil rights struggle and the tasks that future generations must accomplish to bring about full equality. 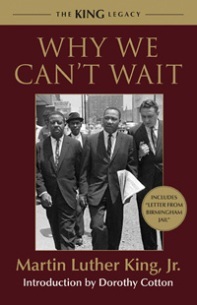 The book also includes the extraordinary "Letter from Birmingham Jail," which King wrote in April of 1963.